This is simply genius! New research published in Science describes technology that allows electrical measurements (and other measurements, such as temperature and strain) using ultra-thin polymers with embedded circuit elements. 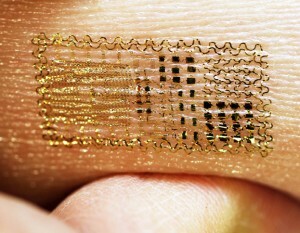 These devices connect to skin without adhesives, are practically unnoticeable, and can even be attached via temporary tattoo. All of the necessary components of the devices, including electrodes, electronic components, sensors, radio frequency communication components, and power supplies, are set within an extremely thin (about 30 μm) elastic polyester sheet. The sheet has a low elastic modulus (that is, it’s flexible) and no noticeable mass (about 0.09 g), so you have a lightweight, stretchable membrane. Circuit elements (such as transistors, diodes, resistors) and sensors are constructed with typical materials like silicon and gallium arsenide, but are linked using nanoribbon and micro/nanomembrane elements to allow extremely small but flexible designs. The authors refer to their approach as an “epidermal electronic system” (EES), which is basically a fancy way of saying that the device matches the physical properties of the skin (such as stiffness), and its thickness matches that of skin features (wrinkles, creases, etc.). In fact, it adheres to skin only using van der Waals forces—the forces of attraction between atoms and molecules—so no adhesive material is required. Between the flexibility and the lack of adhesive, you wouldn’t really notice one of these attached. For a power supply, initial designs used silicon photovoltaic cells to generate electricity, but these are limited to microwatts due to the small area. Researchers also explored wireless inductive power, where an external transmission coil matches the resonance frequency of a small inductive coil in the device (it’s the same sort of tech that’s used in wireless device chargers). This opens up the door for applications that need more power than solar can provide, or for devices that work in low-light conditions (under clothing, for example). The authors also suggest future electrical storage using capacitors or batteries. As demonstrations, the authors used their devices to measure heartbeats on the chest (ECG), muscle contractions in the leg (EMG), and alpha waves through the forehead (EEG). The results were all high quality, comparing well against traditional electrode/conductive gel measurements in the same locations. In addition, the devices continuously captured data for six hours, and the devices could be worn for a full 24 hours without any degradation or skin irritation. One interesting demonstration that also suggests future applications was the measuring of throat muscle activity during speech. Different words showed distinctive signals, and a computer analysis enabled the authors to recognize the vocabulary being used. Imagine having a tattoo that actually does something, for instance a cell phone tattoo that is your cell phone imprinted on your right arm?! Get the Feeling without actually getting Stabbed Or Shot!